Fishermen and albies are plentiful, but stripers are rare at 69th derby. 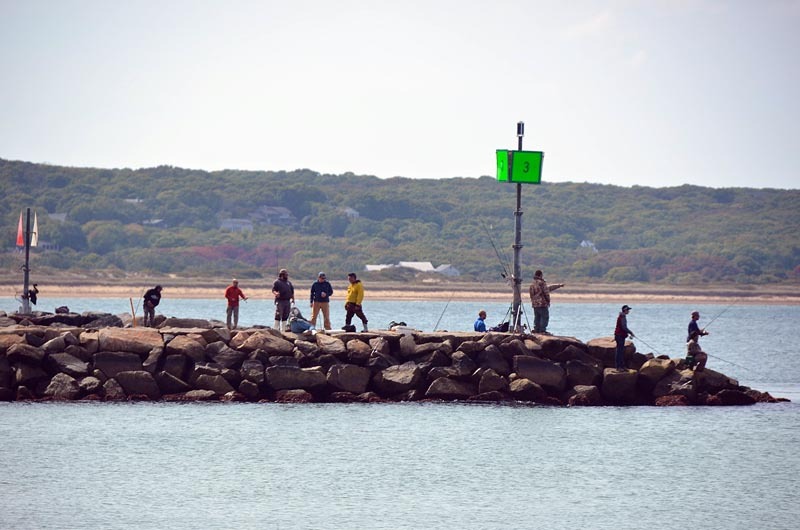 At its halfway point, the 69th Martha’s Vineyard Striped Bass and Bluefish Derby is going strong, with 2,793 contestants and 1,481 entries as of Thursday, including 468 in the week ending Saturday. Last weekend derby headquarters saw some of the heaviest traffic yet, with a line stretching around the corner of the building. Fine weather played a role in the weekend turnout, said Michael Carroll, a member of the derby committee, but he added that the fish were biting. Committee member Amy Coffey, who serves on the weigh station staff, said she hasn’t seen a line out the door in quite a while. Things slowed down later in the week, with the wind and rain. But even on slow nights, the fishing shack is a lively place, with staff members manning the weigh station and leader boards, and local fishermen drifting in and out, with or without catches. Once in awhile a new fish will cross the scale, and everyone will cheer. Wednesday’s weighmaster, Joe El-Deiry, called out the weight of each fish for the small crowd that gathered in the shack. He said the fishing has been good this year, although in the last few days there have been fewer striped bass. Of the four species that may be entered in the derby — striped bass, bluefish, bonito and false albacore — bonito seems to be the most popular catch of the last two weeks, although most of the fish have been small. Derby president Ed Jerome said it was possible that the large numbers of bonito were due to the abundance of sand eels, which the bonito eat – and also the fact that there are relatively few albacore this year. As of Thursday, a total of 377 bonito, 584 bluefish, 336 albacore and 176 bass had crossed the scale. Last year exactly 2,000 fish had been weighed in by the end of the derby. Most of the fish are caught from boats, although about 70 per cent of the striped bass this year have been caught from shore. Boat catches and shore catches are ranked separately, along with separate divisions for juniors, seniors and fly fishermen. 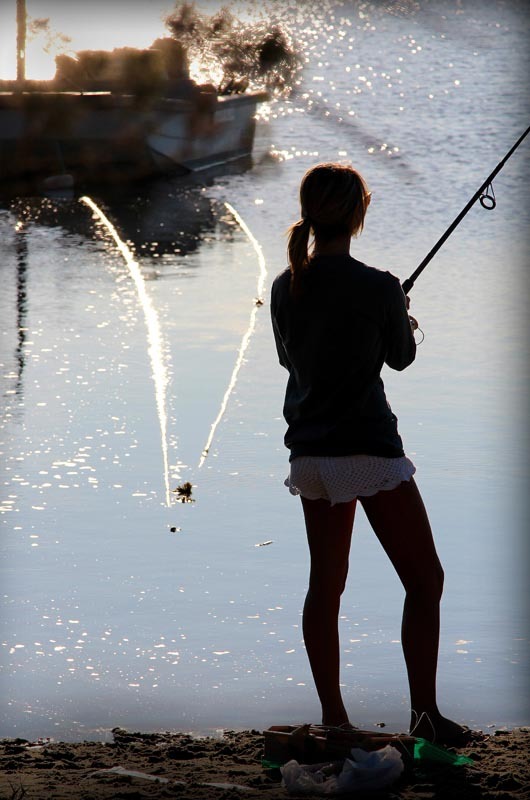 Ms. Coffey said the calm weather early in the week was especially good for fly fishing. “A lot of the fly guys got on the board because the wind laid down,” she said. In the junior division, as of Thursday, Dylan Kadison was holding three spots, including the leading bonito and leading striped bass caught from boats. Mini-junior Mason Warburton held the lead for boat-caught striped bass and albacore. Dylan’s bonito and Mason’s albacore were also grand leaders. Mr. El-Deiry said it was unusual for two juniors to share the grand leader board. Other grand leaders on Thursday included Dylan’s father, David, with a boat-caught bluefish, and Vinnie Iacono with a 39.77-pound boat-caught striped bass, the heaviest fish caught so far. Capt. Eli Bonnell, who is working on the docks every night filleting the catches to donate to local senior centers, received reports that a crew of four or five this week had caught 41 bonito in one night at a spot five miles south of Wasque Point known as the Hooter. “The Hooter’s been crazy for bonito,” he said. Mr. Bonnell was impressed by the weekend turnout. He said 174 fish were weighed on Saturday and 154 on Sunday. He said the weigh station tends to be busier in the evening, since most contestants fish all day. The station is open from 8 to 10 every morning and evening. “There are hundreds of people fishing during the day, and there’s probably 50 or 60 people who fish through the night,” said fillet master Will deBettencourt on Wednesday. Contestants can choose between keeping their fish or having them filleted and donated to the four senior centers. Ms. Coffey said that about 80 per cent of the fish are donated, amounting to between 600 and 700 fish so far this year.